The red howler monkeys are among the largest of the New World. Their hairless face is black and they have a strongly marked beard, the rest of their fur is reddish. 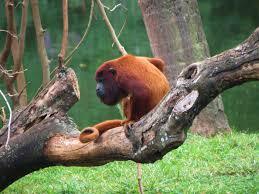 Red howler monkeys are living in small groups in steady small territories, often close to the shores. As their name says, howler monkeys can be recognized from far by their „singing“, specially in the early morning, before the evening dawn or before it will rain. They are feeding on fruit and leaves.